This article was kindly submitted by someone who has studied the gene by communicating with breeders in Collies, Dachshunds and Australian Shepherds. They've put this analogy together to help visualize how the gene plays the role that can result in destructive results. What is a Double Dapple? So, What's Wrong with a Double Dapple? Pretty, yes? But, it comes with a price. He is blind with underdeveloped eyes. Dapple is a pattern seen in Dachshunds. It is commonly referred to as "Merle" in other breeds of dogs (Collie, Sheltie, Great Dane, Australian Shepherd). It is important to understand that dapple is NOT a color, it is a pattern. Dappling can be compared to painting a room in your house. Say you paint the room green. Before the paint is allowed to dry, you dip a sponge in white paint and then dab the walls with the sponge. For each spot that the sponge touches, you will have a lighter green marbling affect that results from the green and white paint blending together. Dapple works in precisely the same fashion. The dappling can occur on any color. A dappled black & tan Dachshund would leave a black base with a gray marbling affect. A dappled red Dachshund would result in a pinkish marbling affect. A dappled chocolate & tan Dachshund would create a cream marbling effect. Precisely where the dappling chooses to occur is anyone's guess. In one litter of puppies, you can have puppies that are dappled from nose to tail or you can have puppies with nothing more than a dapple splotch on the top of the head. A well dappled puppy can go on to produce lightly dappled puppies, just as a lightly dappled puppy has an equal chance of producing heavily dappled puppies. There is never rhyme nor reason to how the dapple chooses to act on a puppy. There are responsible breeders who have worked to understand the gene and how it works. They've also put much into their program to produce healthy dogs, but, these breeders are far and few between. Puppy mills, pet shops and sadly, the Internet have capitalized on unsuspecting people and jeopardized many healthy dogs. Many breeds of dogs come in a variety of colors and patterns. But no breed is as diversified as the Dachshund. There are many acceptable colors and patterns of Doxies, as well as three acceptable hair coats and two sizes. While most people are familiar with the red and the black & tan Dachshunds, it is interesting to note that there are nearly 300 varieties of Dachshunds. Dapple, as I mentioned earlier, is a pattern. When two Doxies breed, they both contribute to each puppy's gene pool. Have you ever played the card game "War"? In the card game both players are dealt an equal amount of cards. Player 'one' flips one card over and Player 'two' flips one card over. The player with the highest value card takes both cards and puts them in their pile. The game continues on until there are no cards left in either player's hand. You can compare the genetic make-up of a puppy to a game of "War". The dam flips over one gene*, and then the sire flips over one gene. The 'higher' valued gene (dominant) goes into the winner's pile. The 'lower' valued gene (recessive) goes into the the loser's pile. When the game is over, the dominant pile is made up of the genes that contribute to the 'outside' of a puppy....those things that we see. The recessive pile is made up of the genes that contribute to the 'inside' of the puppy...those things we can't see. When that puppy is old enough to breed, the dominant and recessive genes are shuffled and a new game of 'War' begins. In the card game, you can sometimes have a tie, both players flip over the same card of equal value. This can also happen with genes in a puppy. In the card game, 'War' is declared and there is a 'showdown'. However dogs have never been known to be as competitive as humans are...dogs simply call it a draw. It's anyone's guess whose gene (the sire or dam) gets to go in the winner's pile, but it is really irrelevant, since both genes are identical. There are thousands of genes involved in the make-up of a dog, from the shape of his ears to the length of his tail. There are approximately 300 known genes that contribute to coat color/pattern in dogs. This article is not intended to give you a crash course in genetics. I am simply trying to lead you into the genetic make-up of a double dapple so that you can fully understand the dangers. The gene for dapple is dominant over the gene for non dapple. As an example, we'll say that the sire flips over the dapple gene and the dam flips over the non dapple gene. The two genes are compared and the dapple gene goes into the winning pile...the part you will see on the puppy. The non dapple gene will go into the losing pile...the part you don't see on the puppy. Every time a dapple gene is passed on to a puppy, that puppy will be dappled because a dapple gene will always be dominant. *Note: For those of you that are familiar with genetics, I wanted to mention that many times the word 'Gene' is used in place of the proper term, "Allele". I feel that describing alleles will only confuse the average viewer and the point can be made by substituting the word 'gene'. If both the sire and the dam of a puppy are dappled, they both have an equal chance of passing on their dominant dapple gene to the puppy. The sire may flip over the dapple gene, and the dam may flip over the non dapple gene. In this case, the sire's dapple gene would be dominant and that puppy would be a dapple. This confuses a lot of people. How can a dapple dog have a non dapple gene? It is easy to forget that every dog has a winning pile...what you see on the outside, and a losing pile...the recessive gene that is hidden. If each dog only had one gene to contribute, there would never be variety in the dogs. When two dogs breed, the recessive genes are shuffled with the dominant genes so that they have a chance to manifest themselves. If the recessive gene meets up with another recessive gene, it finally gets its chance to be in the winning pile. However if the recessive gene again meets a dominant gene, it has to wait another generation for the chance to dominate. It is also possible for both the sire and the dam to flip over their non dapple genes. If this is the case, it becomes a 'draw' and the puppy is not dappled. And finally, it is possible for both the sire and dam to flip over their dapple genes. Again, it is a draw, but something totally different happens. We'll say that the sire's dapple gene gets to go in the winning pile. The puppy is now dappled. But the dam also contributed a dominant dapple gene. Her gene says, "Whoa, wait a minute buddy! What do you think this is, the 19th century? I demand equal rights here! I want a chance to dapple this puppy and the 19th Amendment guarantees me that right!" So the dam's dapple gene goes to work, after the sire's gene has already made the puppy dapple. Since it's anybody's guess as to where the dapple gene will hit (remember the sponge painting in the first chapter? ), the outcome will vary greatly. We'll assume, for ease of understanding, that the sire dappled the tail, and nothing more. The rest of the puppy was a normal color and untouched by the dapple. The dam's gene is mad at almost missing out on her chance, so she dapples the entire body...from head to tail. The areas that the sire's dapple gene left untouched would now be dappled by the dam's dapple gene. However, the area that the sire's gene did dapple (the tail) would be dappled again. For reasons unknown, the combination of two dapple genes hitting the same area of the dog can be lethal. I have seen double dapple puppies born with no eyes, and/or no ears. Blindness and/or deafness is also caused by the double dapple gene. On the other hand, a double dapple can be born with no deformities at all. There are no facts or figures available (that I have found) that tells us how many dogs like this dog have been whelped. The double dapple pattern is an acceptable pattern that is recognized by AKC. In my opinion, if AKC continues to allow this pattern (which can only be achieved by breeding two dapples together, so it is totally preventable) to be recognized, then serious studies should be done to look at the damage being done to the dogs. I, for one, feel that even one dog like this is not worth the risk of a million healthy dogs. For every deformed double dapple, there is a different excuse. Here are a few of those 'excuses' and a few solutions. 1. Simple ignorance: Genetics are a complicated matter and many breeders won't even take the time to try to learn. Solution: TAKE THE TIME TO LEARN! There are two foundation books on genetics. Both are excellent books but both are out of print. Try your local library! "Genetics of the Dog: Malcolm Willis"
" Inheritance of Coat Color in Dog: Clarence Cook Little"
2. Genetic background unknown: Although the only way to get a double dapple is to breed two dapples together, there are many people that don't know they own a dapple. a. Red dapples often fade as they get older. A Doxie that was poorly dappled at birth, and is red it color, will probably not be recognized as a dapple later in life. Solution: Don't breed reds to dapples. If you do, make sure you examine every puppy from head to toe at birth. This is when the dappling is most noticeable. Be sure to mark a puppy as a dapple, even if it has no hint of dapple at eight weeks of age. b. Other colors of dapples are often so lightly dappled, they are not marked as dapple on their papers. Solution: Again, be sure to record dapples at birth. A good sign of a dapple (assuming one of the parents was a dapple) is if a puppy has any blue flecks in the eyes. The dapple pattern can color the iris of the eyes, just as it covers the color of the coat. When the dapple pattern hits the iris, it turns it blue, like that of a Siberian Husky. Since the dapple pattern is so sporadic, it can hit just a spot on the eye, causing a normal color eye with a tiny blue fleck. 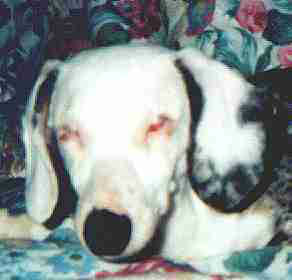 Always mark blue eyed or partial blue eyed pups as dapples if there is even the slightest chance that it is a dapple. 3. Mistaking double dapples for piebalds: This is the most aggravating of all the mistakes made. Without getting into the genetics behind a piebald, I will tell you that a piebald is a normal color Doxie with varying amounts of white. A piebald does not have dapple. A piebald does not have blue eyes, or partial blue eyes. A Piebald is normally marked symmetrically...meaning that if one ear is black, the other ear is black. If one paw is white, the other paw is white. If one side of the face is white, the other side is equally white. A double dapple is not symmetrical. You will often see one leg normal colored and the other leg totally white. One side of the face can be white and the other side dappled. These are the easiest way to tell if a dog is double dappled or piebald. Solution: If you aren't sure if your dog is double dapple or piebald, look at the pedigree! A double dapple will always have a dappled dam and a dappled sire. A piebald can come from any color, but you will normally see piebald in the background. Since piebald is recessive, it is possible to have two plain black & tans produce a piebald. However ONLY TWO DAPPLES can produce a double dapple. The ultimate test of a double dapple is to breed it to a plain colored dog. If the puppies are dapple, your dog is a double dapple! Note: There is a lot of evidence of people marking double dapples as piebalds. I was curious to see what AKC had to say about it, so I called them and told them that I had a litter of Doxie puppies and one of the puppies had a lot of white on it. I was told that if the puppy had 50% or more white, to mark it as a piebald. This is absolute INCORRECT and DANGEROUS information! Use a combination of the info given to you here to determine if your dog is a double dapple or a piebald. 4. For the show ring: There is no doubt about it, a double dapple is stunning. The combination of dappling and white is flashy and many breeders purposely breed dapple to dapple in hopes of show prospects. If you know what you are doing; if you know the risks; if you don't mind the chance of deformed puppies; then "More Power to You." Solution: I'm left to do my best Forrest Gump impression and say "...and that's all I got to say about that..."
5. Greed: If we go back to the genetics behind a double dapple, you will remember that a double dapple results when two dapples both contribute their dapple gene to one puppy. That puppy, if he goes on to breed, will have two dapple genes that will be shuffled and eventually dealt out into the gene pool. Since the dapple gene is dominant, and the only thing that puppy has is a dapple gene, there is a 100% chance that every, single puppy that dog produces will be a dapple. In other words, a double dapple will ALWAYS produce dapple puppies, even when bred to a normal color dog (black & tan, chocolate & tan, etc.). Since dapple puppies normally command a higher price, there are breeders who purposely breed dapple to dapple, in hopes of getting a double dapple. That double dapple can then be used to produce all dapple puppies...all of his life. It is interesting to note, that even a dog which is totally blind and deaf will NEVER produce a deaf or blind puppy (providing that he isn't bred to another dapple or carrying some other genetic defect that causes deafness/blindness). 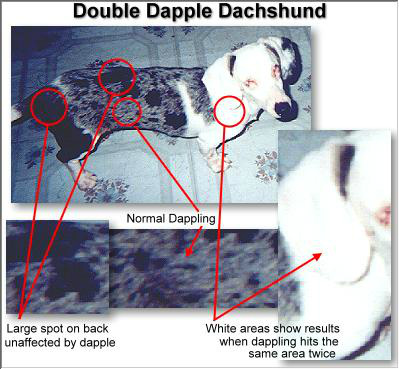 The deafness/blindness seen in double dapples is only a result of the two dapple genes. Solution: There is no solution for this sort of breeder. Greed is more powerful than compassion. The double dapple deformities are not seen just in Dachshunds. As I mentioned earlier, the pattern (referred to as Merle) are seen in several other breeds of dogs. In my experiences, when deafness and blindness are seen, the dog is generally very well adjusted and very 'well adjusted'. Which is so fortunate. Getting the word our about irresponsible breeding of dapples is important. Many of you are in large cities where you have the ability to get the word out about the dangers of double dapple breeding. Many of you attend dog shows regularly and can pass out literature (feel free to print this article) to people at the show. Something as simple as scanning the internet for breeders selling double dapples (which are often listed at piebalds) and sending them the link to this article, can go a long way to educate a lot of people. If you have the resources to provide a loving home to a dog that is deaf and blind (even if it is for a breed other than the Doxie), find Doxie, Aussie, Collie, Dane, etc. rescue groups on the internet and volunteer to adopt or foster a handicapped double dapple/merle. Don't adopt out of pity...it is a huge undertaking to adopt one of these guys.